NCP MLA slaps Deputy Collector, Caught on Camera, Video Goes Viral : Suresh Lad who is the NCP MLA from Karjat was caught on camera slapping a Deputy collector of Raigad district, Maharashtra. The video has gone viral on social media. The NCP legislator denied having assaulted the Deputy collector. After a disagreement over compensation to farmers for land acquisition, the Nationalist Congress Party MLA Suresh Lad slapped Raigad Deputy Collector (land acquisition) Abhay Kargutkar. 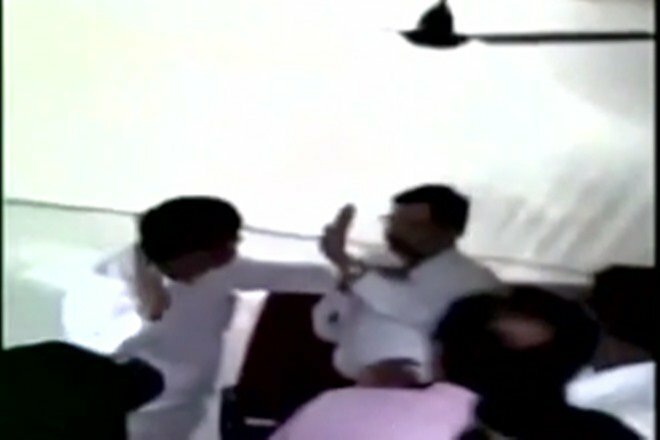 NCP legislator was caught on camera when he slapped the deputy collector of Raigad district, Maharashtra. On last Thursday, The incident took place during a meeting called by the Deputy collector Abhay Kargutkar to settle disputes about land acquisition for an oil pipeline. Nawab Malik who is the NCP spokesperson said that the MLA has denied having slap the official. Malik said that Why is the official silent? Why has not he lodged any police complaint, if he was indeed assaulted. Another NCP leader said that the location where the incident took place was not a government office but the premises of a leading corporate house. He said that Maybe that’s why the official, who was acting as an agent of that corporate, is keeping mum. But an official said that DC Abhay Kargutkar has lodged a complaint with Palghar District Collector over the assault by NCP MLA Suresh Lad. Kargutkar has said in a letter to the Collector that he was assaulted by Suresh Lad.